Hi Friends: Are you all ready for Halloween? I love to watch see all the kids dressed in their costumes! Maybe I'll see a few fairy princesses that night! Please visit our fabulous sponsor this week, Nikki Burnette, to see all of her wonderful products! My creation for this week is a card using the Fairy Christina digital stamp. I hope that you are inspired by my creation and will join us over at the CWWC blog to see the creations of the other design team members and enter for your chance to win a great prize from our sponsor. I printed the image onto smooth white cardstock and colored her with my Colour Blend pencils, blended with Gamsol. I cut her into an oval shape using my Creative Memories cutting system, then attached some lace, colored with LSG sprays, to the back. For the gems on her dress, I added sticky-backed gems and some Glossy Accents. I added some glitter pen to her wings for extra sparkle. Around the edge of the oval, I colored a bit with the LSG sprays, but wanted a bit more texture, so I dotted a frame using a silver Pearl Pen. I cut the Prima background papers into the desired shapes from the sketch, sewed around the edge, then attached them to my card base. I added some more of the lace to the diagonal edge of the paper, then sprayed the entire card with some Perfect Pearls Mist for more shimmer. I used fun foam to attach the oval image to the card front. I painted the flowers with LSG sprays to adjust the color, then attached them to the bottom of the oval. I cut some vines from the same Prima papers and added them around the flowers. To finish, I stamped the sentiment onto white cardstock, colored it with some more of the LSG sprays, and attached it to the bottom of the card. Labels: CWWC, LSG sprays, mixed media, Stampin' Up! 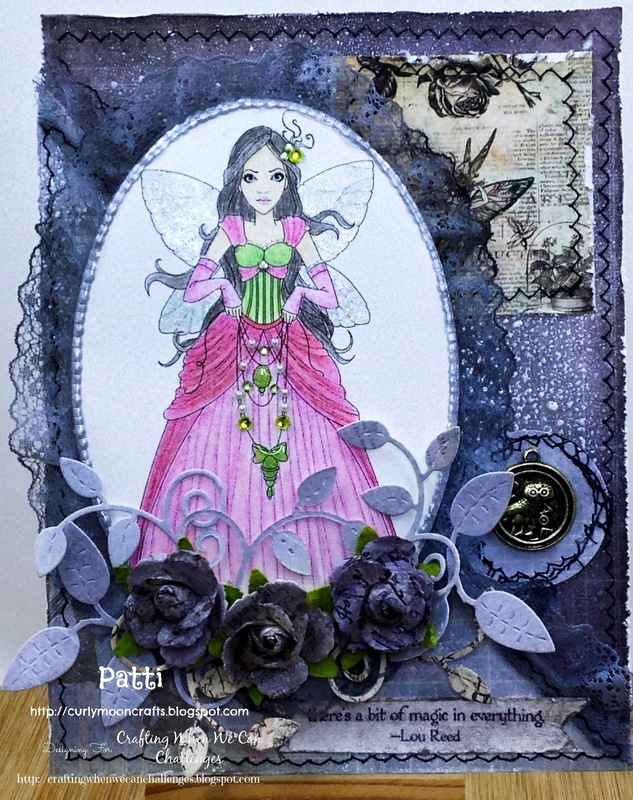 What a lovely card, Patti; you surrounded your princess with some gorgeous embellishments! We had our Halloween yesterday afternoon and there certainly were a few princesses visiting our house! Thanks for playing along with us at the Simon Says Stamp Wednesday challenge!